One of the largest course-racing regattas in North America, the Verve Cup is an annual world-class sailing event attracting many national and international competitors. Both the 3-day Offshore Regatta and, later, the 2-day Inshore Regatta host well over 100 yachts to our beautiful Chicago lakefront and skyline. 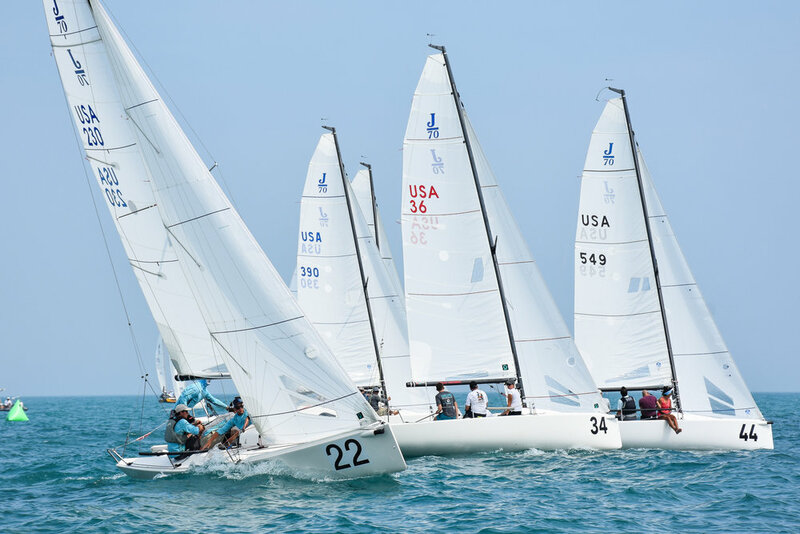 Annually, the Chicago Yacht Club hosts the Verve Cup Regatta in August. This event features a three-day Offshore Regatta with a separate one-day Distance Race in the beginning of August, and a two-day Inshore Regatta with a separate Radio Controlled sailboat series later in the month. For the Offshore Regatta, participating yachts range in size from 25 to 80 feet, and carry crews from 4 to 20 racers. During the regatta, we, the Chicago Yacht Club, welcome over 2,000 racers, family members and friends to our award winning lakefront Monroe Station clubhouse. Each participant is treated to three days (Friday, Saturday and Sunday) of top notch racing, scenic views and outstanding organization. The spectacular daily racing is all followed up by exceptional food (indoor dining or al fresco), entertainment and camaraderie. Competitors participate in daily multiple windward-leeward races. Boats sail either in a rating handicap section, so boats of different size and character may compete against each other, or in a One-Design section. Typically there are 18 racing sections dispersed among three racing circles. Brag flags and prizes are awarded to the top finishers in each section and one offshore boat, the winner in what is determined by formula to be the most competitive section, “The Elite Fleet,” is awarded the perpetual Verve Cup Trophy. The Verve Cup Trophy dates back to 1893 and is the Chicago Yacht Club’s oldest trophy. Likewise, for the one day Saturday Distance race, brag flags and prizes are awarded to the top finishers in each of the four handicap sections and the first place winner by handicap is awarded the CYC's 8 Mile Buoy Trophy. Merchandise, clothing, equipment and souvenirs are available for sale to all the racers, their families and friends. Race sponsors set-up kiosks and displays during the race week for everyone to enjoy. Food, beverage and music are provided during each evening’s festivities. The Sundowner Party is held on the Saturday of this fantastic racing weekend were music, free rum pour, and complementary appetizers, popcorn, pretzels and slushies abound. The Verve Cup Inshore Regatta is a spectacular sailing event geared towards the smaller trailer-able One-Design racing boats. Hosted each August by the Chicago Yacht Club at its scenic and conveniently located Belmont Station, the Verve Cup Inshore is the most popular inshore regatta in Chicagoland. Identical boats in One-Design Fleets compete for two days (Saturday and Sunday) to determine which boat has the best skipper, crew and preparation. Fleets only need five boats to register to participate, so mobilize your class and sign up for some great racing at CYC's Belmont Station held each August! Etchells, Vipers, Star, Sonars, Shields, Colgate 26, Luders 16, Rhodes 19, Solings, J/70s and J/24s were all part of the competition in past years. Each year the Verve Cup Inshore seems to get bigger and better, and the Chicago Yacht Club is working feverishly to assure that this year’s Verve Cup Inshore again will have the best One-Design sailing around. Our venue features optimal late summer breezes, competitive racing, and the best race committee on the water. The Verve Cup Inshore delivers outstanding racing with parties held at the conclusion of each day's racing. Big name sponsors providing premium swag and generous free pours turn the evening party into a real blast. Get on-board for the Verve Cup Inshore, arguably the best One-Design Sailing event in the Midwest! The Chicago Yacht Club hosts over 125 races per year. The Chicago Yacht Club Race Committee consists of over 100 dedicated volunteers, both CYC members and non-members. The Club is proud to have over 25 U.S. Sailing certified race officers in its ranks, and most other volunteers have participated in race management seminars and training programs. The Chicago Yacht Club Race Committee facilitates a fair, quality, and competitive racing program. Race Committee volunteers love being on the water and are interested in learning more about race management. The Chicago Yacht Club hosts over 125 races during our season, including the Race to Mackinac, Sailing World’s Chicago NOOD Regatta, the Chicago Yacht Club’s Verve Cup Regattas, and the Chicago Regatta. Other events include the NACC for Disabled Sailors, One-Design Seasonal Championship Racing (Nationals or otherwise), the Commodore’s Cup, Sheldon Clark, Wednesday Night Racing at both Monroe and Belmont Stations, and "Frostbiting" in the spring and fall. We are always looking for new and enthusiastic volunteers to join Race Committee. If you are interested in getting involved, contact our Regatta Manager, Sydney Symons at (312) 861-7777 or Email her at RegattaManager@ChicagoYachtClub.org. The Chicago Yacht Club recognizes that the strength of a regatta can be determined by the quality of the partnerships developed with the event sponsors. We would like to take this opportunity to thank our sponsors who have helped make The Verve Cup Regatta a success year after year. For over 30 years, Mount Gay has been a sponsor of competitive sailing, playing host to over 150 regattas around the globe each year. Today, Mount Gay is a highly-regarded figure in the sailing world. We thank Mount Gay for their support of The Verve Cup Regatta. To learn more and stay up to date with Mount Gay Rum’s regatta events, please visit their Sailing Spoken Here Facebook page.